Altitude Adjustment ready to greet you! 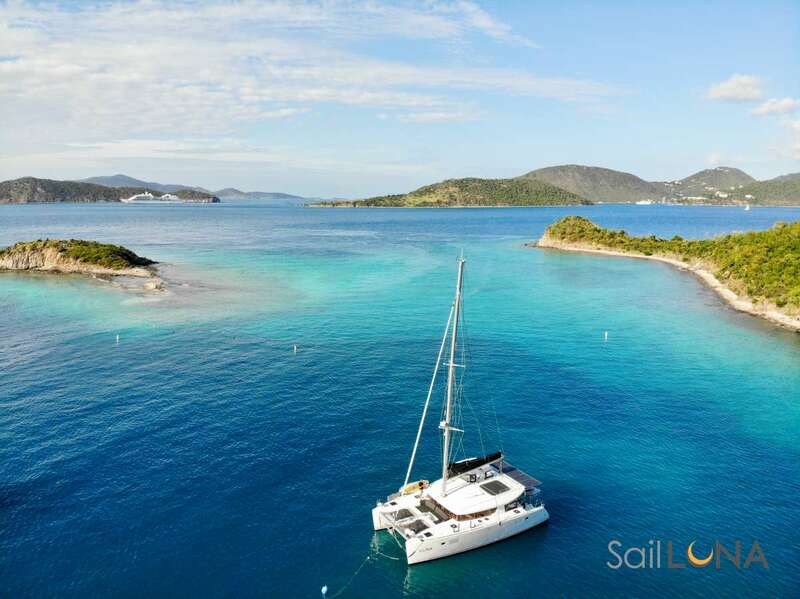 Capt Brian suggests rendezvous diving with Low Key Divers in St John, USVI and Dive BVI in British VI´s. Offer: A 10% discount is offered on the charter rates for one week between 3-11 May 2019. Send us an inquiry to get specific pricing for Altitude Adjustment. I cannot say enough positive things about our time aboard Altitude Adjustment. Captain Brian is an amazing cook and even accommodated our two picky eaters and got them to try new things. He took us to see a variety of amazing places! The snorkeling in St. Johns can not be beat anywhere in the world! The boat had everything we wanted or needed from snorkeling gear to a phone charging station. The extras such as the paddle board and kayak were a great way to explore the different beaches. Thanks Brian for a wonderful trip. My 4th grader has written a 600 word essay about just how much he loved it! A trip of a lifetime! Can´t wait for next time. Thanks for making everything unforgettable! A trip only dreamed of! Thank you so much for everything! This was a trip that is only dreamed of. Thank you for a tip that I´ll never forget! It was perfect! Thanks for everything. A Dream Come True and Perfect Destinations! Just returned from a 6 day cruise. It was incredible and a dream come true. Brian (our captain and owner) worked with us on where we wanted to go and what we wanted to see. He took us to so many amazing beaches and a couple of them we were the only ones there. The different shades of blue water in the Caribbean Ocean were breathtaking. Snorkeling and diving were good, lots of fish to be seen. We went to Culebra, Isle of Culebrita, St. Johns and St. Thomas and Palomino Island. Perfect destinations!!! Brian made sure there was never a lack of food. He made some wonderful meals and we always looked forward to the ´drink of the day´. I would definitely do it again. Brian went above and beyond to ensure that our needs were met and that our vacation was enjoyable. Good job Brian!!! This was by far THE best vacation we´ve ever taken. Stress free, most beaches Brian Saupe took us to were deserted or only a handful of people, and all logistics were taken care of. Our only concerns were how many rum drinks to consume and remembering to put on sunscreen. Our experience far exceeded our expectations! Brian was the consummate host and went above and beyond in both service and consideration. I would recommend him to anyone and will certainly pass my experience on to others Vacation of a lifetime !!! J & T.
´Altitude Adjustment Cruises: Friends and family, you HAVE to do this. Your spirit needs the Caribbean, and this is the boat to cruise it on. BEST DECISION EVER...and yes I am hollering that last part.´ EricaR. Hot breakfast accompanied by muffins, fresh fruit, and choice of beverage. French-style tropical fruit crepes, omelettes, French toast, pancakes, eggs to order, etc. Daily lunch made to complement guest itinerary. Served with choice of beverage. Hot Italian grinders, Thai curry coconut poached shrimp, seared tuna sliders, classic French dip, etc. Captain Brian´s Drink of the Day and appetizers. Italian antipasto platter, mini-short rib tacos, crostini with grilled mango and goat cheese, etc. Hearty Captain-crafted original fare with a choice of beverage. Grilled steaks, parmesan crusted sea bass, shrimp fajita burritos, teriyaki chicken stir fry, etc. Nightly sweets to complement dinner, accompanied by a beverage of choice. This menu is a sample of the typical menu for a 7 day trip aboard Altitude Adjustment. Everything is flexible and can be changed with advanced notice to suit your preferences.